Travel to a world of struggle and heroism with our infamous Weapon X Wolverine fighting one of the world-ending, mutant hunting Sentinel machines! Beast Kingdom is proud to present its latest Diorama Stage series: The PREVIEWS Exclusive DS-021 Marvel Comics Wolverine (FEB198138; SRP $29.99)! With years of irreplaceable adventures, collectors can now revisit and forever keep pivotal moments in the cherished comic-book franchise. 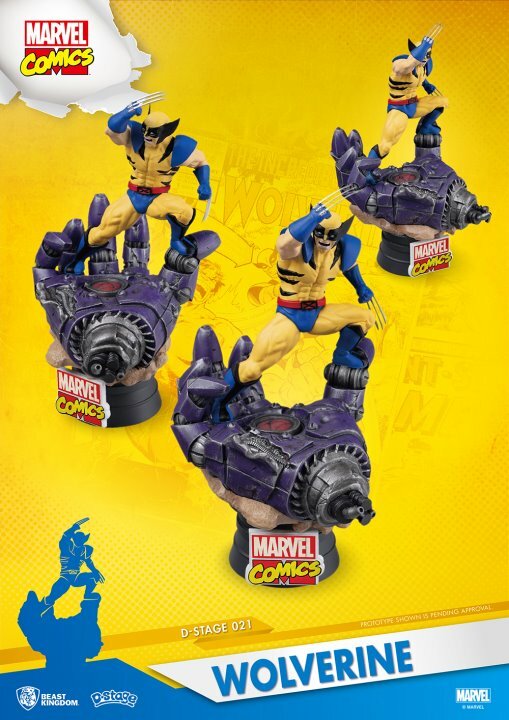 With a design based on the classic comic setting, the DS-021 Marvel Comics Wolverine incorporates sophisticated modelling techniques, a detailed diorama design, and delicate yet highly immersive paint work. Continuing the explosive MCU storyline and the mysteries surrounding Avengers: Infinity War, Carol Danvers, A.K.A. Captain Marvel is poised to be the almighty savior in her very first movie as well as the next installment of the Avengers: Endgame! With an EAA stylized design, intricate paint detailing, a Red, Blue & Gold classic costume, light up helmet and the remarkable star Icon in front of her chest, Beast Kingdom is proud to present the PREVIEWS Exclusive EAA-075 (FEB198136; SRP $100.00), arguably the strongest superhero in the MCU: Captain Marvel! The EAA-075 features 22 points of articulation, numerous accessories, interchangeable hands, LED light up function with the helmet and last but not least, the inclusion of the adorable cat, Goose, melting the toughest of hearts! With a strong focus on detail, the EAA-075 Captain Marvel, is the perfect addition to the growing roster of Earth’s Mightiest Heroes. Are you a Marvel fan? Who is your favorite character(s)? Let us know in the comment section below. Also, Don’t forget to like, share and subscribe to all things Constant Collectible to keep up to date with all the news and reviews from a world of GEEK CULTURE.